Welcome back volatility! What a wild ride February is proving to be. Is the bull market over or simply due for a well-deserved pause? I don’t have an answer to either of those questions, but if one were to look at a daily chart of $ARNA, you’d have no idea there was anything terribly unusual about trading activity this week. $ARNA has been in a tremendous uptrend since the summer that climaxed into a large gap higher to start calendar year 2018. It has spend the rest of January generally digesting that gap, but now appears to be setting up for another possible leg higher. The resilience the stock has shown while the S&P 500 has shed nearly 10% in about a week offers further proof that this stock has designs on higher prices, especially if the general stock market can begin to stabilize. As such, I announced on twitter yesterday (Feb 8) that we’d be adding ARNA to the portfolio at today’s opening price, which was $38.62. As always, we’ll trail this position with a roomy 20% trailing stop loss from the high print we see while holding the stock. We saw our first swing trade exit this week. 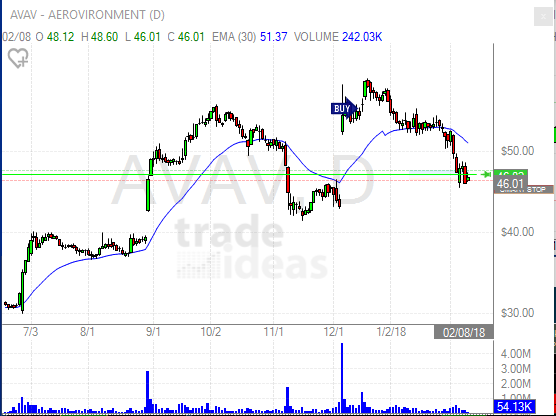 We got kicked out of $AVAV as it ended up being on a mission to fill the gap that was created back in early December. Oh well, every trade is not going to work out. 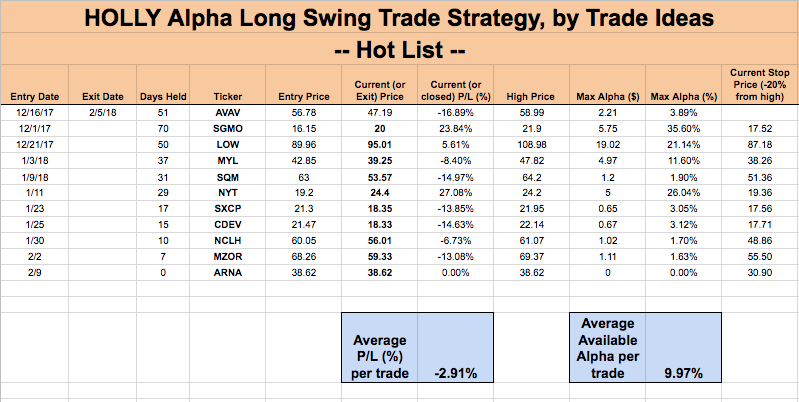 The max alpha possible in our trade was a touch under +4%. Not great, and certainly not what we’re shooting for. But again, they can’t all be winners. If you held all the way to our stop loss point, this position lost approximately 16%. Meanwhile, the rest of the portfolio took it a bit on the chin. No surprise since we’re involved in momentum names that certainly benefit from bullish broad market rallies. And it may just so happen that we launched this portfolio during the dying days of the most recent market rally. Only time will tell, and this is why we’ll simply stick to our plan, honor our stop losses, and continue looking for trades discovered by HOLLY that capture our attention on longer time frames.